Get the Touch of real brush strokes with a marker. The Touch Twin Brush Marker features a distinct fine brush nib on one end and a medium-wide chisel nib on the other, allowing users to express a wider range of techniques. The newly broadened color spectrum of 204 brilliant colors allows artists and designers greater possibilities and freedom of expression. The innovative and durable design of the nibs ensures they will not lose their firmness over time. Optimum ink flow and drying rates allow for seamless execution of even the most detailed artwork. 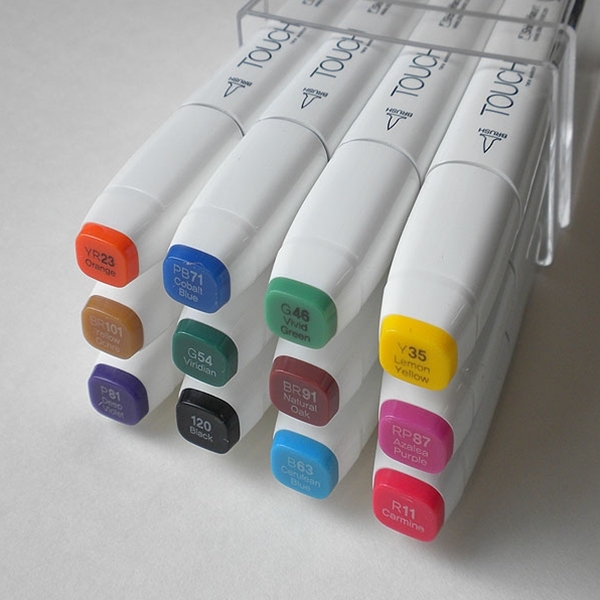 Refillable ink and replacement nibs add to the longevity of the Touch Twin Brush Markers. 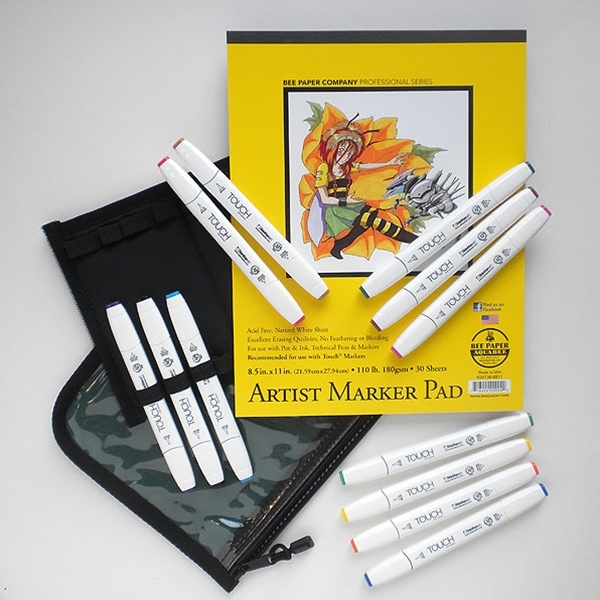 The Portfolio Marker Case is a great way to carry markers in a portfolio or similar bag. Its sleek design and narrow space saving profile make it a great way to store pencils in a standard portfolio or tote. This case is made of 600 denier fabric with a clear vinyl front and a quality nylon zipper closure. The case has an insert that securely holds 12 markers. The insert can be removed and folded into a triangular shape for desktop work. Assorted colors. Acid free, natural white sheet with excellent erasing qualities. Our crisp, bleed proof, ultra smooth 110# (180 gsm) sheet is especially designed for detailed work. Approved for use with Copic and Touch markers and ink, Artist Marker Paper has an excellent surface for use with pen and ink, crowquill pens, technical pens, water-based and permanent markers.